It was a warm summer day. I went to water my petunias and there she was, sitting there in the flowerpot with my petunias! She didn't say a word. Her flowery dress just sparkled in the sunlight, as she touched each flower into a beautiful bloom. 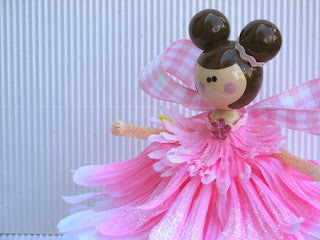 She's magical this Fairy; with the cutest gingham wings I've ever seen. I'm guessing she's some kind of Country Chic Fairy - but I have to say, she's not the neatest Fairy, because there was Fairy dust everywhere, but it did make the flowers sparkle like a rainbow! She's at my Etsy shoppe now, just flying around sprinkling her warmth and friendliness. This doll is darling! Can't wait to get my little beach doll! Am wondering what you are using for the white corrugated background for your photos? I need some "beadboard" for my dollhouse and this looks like it would be perfect?! Oh I just used corrugated paper. And your beach doll is on her way to you!! I sent her out today, Tuesday!! Thanks so much!! I got my little beach doll yesterday! She is so darling! I loved the way you wrapped the package and your sweet note! Her little bucket of shells is just too cute! I'm not sure what her name will be? Maybe Susie or Sandy? She is adorable and will be watching over the renovation of my dollhouse. Let me know when the house is completed, and I'll keep watch too at your blog!! I would love to see it done.